Is there a morph for using the DAZ Horse 2? no I just resized the neck on horse2 and tweek the v4 morph to make it work for now. I know that I could probably figure it out on my own but would you mind sharing some settings you use to do this? If you could do that I know that others including myself would appreciate you sharing the steps to this procedure. i dont remember the settings sorry i save the preset but that dosent aways show what the setting were to start with. i started with the neck 1 and 2 and hide rest of neck and head. i ajusted the size on the x,y ,z one by till i got what i wanted. thats the best i can tell you sorry i cant be more help. Just a quick "Head's Up" for centaur fans. There's a new M4/V4/K4 'taur models just released over on Philosopher's Egg site. They look quite nice, The models take a different approach, in that the equine parts are a whole new, separate figure..not based on any of the usual horse figures. I just purchased them and did a very quick and dirty render of the M4 one. One thing that's missing ( hint to more talented folks) is any basic poses for them..everything will have to be manually posed. Hello! I am trying to find the Philosopher’s Egg site, and neither google or yahoo produce any relevant links. And the only other currently popular 3D site not mentioned so far is DNA. Is that where you're talking about? No, the site certainly exists, and has been around for several years. It's Kemp Sparky's site. There's a legacy content collection which is very nice to have, the goat morph for the DAZ sheep, and for the past several years the owner has been making a fine reputation on the basis of anthopomorphic creature morphs for gen4 figures. He used to make announcements in the forum here, but that was on the old forum some years back. He also has some morphs for the HiveWire horse over on the Hivewire site, as well as a cat morph for Dawn. There's no apostrophe in philosophersegg and no www preceding it, but it's a standard dot com. Plus, I fogot to say this product isn't a freebie..but it IS on special at the moment. Would it be possible for someone to upload the modified files for horse 2 and G2F? 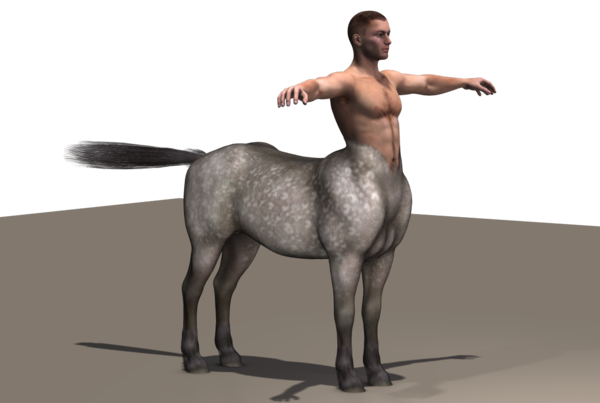 I'll just say that if someone makes some good centaur morphs for Genesis 2 and Horse 2, I'm lined up ready to toss money at you. :) Very interesting. Lets see if I can make some centaurs with G4 figures (M4/V4). Really late to the game, but a technical question...why couldn't there be two graft objects that mate to each other via simple parenting? One graft to replace the human hips (I'm preferring Genesis here) and another to replace the neck of the Mil Horse, 1 or 2. They could stack at the meeting point like a pair of plastic cups, in order to completely hide the seam. Both grafts are designed with shared morphs to match each other's midline shape as close as possible. A couple of carefully graded opacity layers and a few adjustment morphs should help with body morphs that don't match up perfectly. Lower graft fit to horse. Upper graft fit to human. Entire human parented to horse's neck bodypart. One thing that was discovered a LONG time ago, was that in the process of making morphs and such in external modelers, we can NOT add to or remove from the actual mesh itself, not even one vertice or polygon. If we DO then the whole mesh fails. Utterly. The programs will not even load the item AS the item it was and nothing works with it. So, Hemi devised some ingenious and clever actions that keep the mesh intact. He created poses and morphs for the MilHorse head and neck parts plus poses to just hide the humanoids legs and adjust the hips/glutes and then parent the humanoid to the horse, more pz2 posing to reposition the humanoid and rescale it, then we have the Centaur! So where he could do some dial spinning, he did, where he could not, he made morphs. He really worked hard to make it easy for us to have our Centaurs! Sparky over at Philosophers Egg has a nice looking centaur for V4, M4 ans K4 that are composited the same way but with his own horse. They look good worth looking into if one does not have either of the MilHorses. Here is an item most folks don't even think about any more. I'm aware of the mesh order restrictions...and many of us tinkerers have probably learned that the hard way, particularly before DAZ gave us geografting. I did try Hemi's K4 Foal set with a young Genesis and got pretty decent results. Like others, I wish there was one out there that didn't require lots of fiddling about for each character change. I still like G1 due to the power of nigh-infinite morphing, but it seems like this area is one of the rare tricks Genesis doesn't do with ease. I'm considering the PhilosophersEgg centaurs, though Hemi's stuff is doing most of what I want. Anybody here know if they're what DAZ calls unimesh? I made preteens for Mil 3 by blending the kids with the teens and am thinking I might be able to wrangle the K4 and M4 centaurs into one beast that would fit my Genesis needs. I still have my LE animals in the barn with all the rest of my critters. ^.^ Haven't even gotten the new DAZ horse...maybe in the next sale. Ahh ok! I thought you looked familiar. I wan't in this scene as early as you. When I should have got into mesh modeling I was still too busy having fun shooting up places all around In the Quakes and Unreals and then Half-Lifes. Now, nobody is doing THAT and all those folks are using modelers of various make and having more fun that way. I have the tools, perhaps it isn't too late to begin enjoying them. Two terms you use lost me. "Mesh Order" and "Geografting". Not being a modeler and following those respected forums, I suppose I missed far more than that! By mesh order, I meant the numerical order behind the scenes. All the polygons and points of 3D objects are described with coordinates in the geometry file, one-by-one. This includes descriptions of part groups (abdomen, left foot) and surface groups (torso, face.) UV texturing and Poser/Studio figures rely on those numbered coordinates to sort their output into what we see in the rendering programs. When a mesh is edited and resaved, many 3D editing programs change those numbered descriptions too much if things are added or removed, which is the problem you described earlier. Geografting is what we use to add horns, tails and extra arms onto figures. It requires preserving a ring of polygons from the original figure with its original point numbers, in order to avoid the above problem. That is interesting. I suppose the shell works like conforming clothes for the hybrid/grafted figure. Speaking of clothes, I'm trying to avoid dynamics and finding I have very little in the way of female clothing that isn't either a bra or a shirt/tunic that goes past the waist, for Genesis, K4 or V4. Most of the corsets even go too low. Couldn't find anything in my library in-between that didn't look silly on a centaur – fantasy or modern. I wound up hacking textures for the MFD to get something that only covered down to the belly without visibly intersecting the horse. Just fiddling so I didn't have anything particular in mind, beyond making the filly decent. She's too young for most armor. I think I positioned the human portion lower than most of you, which made the transition fit better but is adding to my clothing issue. Will have to try tweaking that, then give the shirt another go.